Pākehā is a Māori language term for New Zealanders who are “of European descent”. Recently, the word has been used to refer inclusively either tofair-skinned persons or any non-Māori New Zealander. Papa’a has a similar meaning in Cook Islands Māori. Its etymology is unclear, but the term was in use by the late 18th century, and in December 1814, the Māori children at Rangihoua in the Bay Of Islands were “no less eager to see the packaha than the grown folks”. In the Māori language, plural nouns of Pākehā may include Ngā Pākehā (definite article) and He Pākehā (indefinite article). When the word was first adopted, the usual plural in English was Pakehas. However New Zealand English speakers are increasingly removing the terminal s and treating Pākehā as a collective noun. Opinions of the term vary amongst New Zealanders. Some find it highly offensive, others are indifferent, some find it inaccurate and archaic, while some happily use the term and find the main alternatives such as “New Zealand European” inappropriate. In 2013, the New Zealand Attitudes and Values Study carried out by The University of Auckland found no evidence that the word was derogatory, although only 14% of the overall respondents chose the term Pākehā with the remainder preferring New Zealander, New Zealand European or simply Kiwi. Māori in the Bay of Islands and surrounding districts had no doubts about the meaning of the word pākehā in the 19th century. In 1831, thirteen rangatirafrom the far north of the country met at Kerikeri to compose a letter to King William IV, seeking protection from the French, “the tribe of Marion”. Written inMāori, the letter used the word pākehā to mean “British European”, and the words tau iwi to mean “strangers (non-British)” — as shown in the translation that year of the letter from Māori to English by the missionary William Yate. Māori also used other terms such as tupua (“supernatural”, “object of fear, strange being”), kehua (“ghosts”), and maitai (“metal” or referring to persons “foreign”) to refer to some of the earliest visitors. However, The Concise Māori Dictionary (Kāretu, 1990) defines the word pākehā as “foreign, foreigner (usually applied to white person)”, while theEnglish–Māori, Māori–English Dictionary (Biggs, 1990) defines Pākehā as “white (person)”. Sometimes the term applies more widely to include all non-Māori. No Māori dictionary cites pākehā as derogatory. Some early European settlers who lived among Māori became known as Pākehā Māori. The etymology of Pākehā is unknown, although the most likely sources are the words pākehakeha or pakepakehā, which refer to mythical human-like creatures, with fair skin and hair, sometimes described as having come from the sea. When Europeans first arrived they rowed to shore in longboats, facing backwards while rowing the boats to shore. In traditional Māori canoes or “waka”, paddlers face the direction of travel. This is supposed to have led to the belief that the sailors were supernatural beings. In her book The Trial of the Cannibal Dog: The Remarkable Story of Captain Cook’s Encounters in the South Seas, anthropologist Anne Salmond wrote that tribal traditions held that Toiroa, a tohunga from Mahia, had predicted the coming of the Europeans. He said “ko te pakerewha”, meaning “it is the pakerewha”, red and white strangers. There have been several dubious interpretations given to the word Pākehā by people aiming to discredit it as a term. One claims that it derives from poaka the Māori word for (pig), and keha, one of the Māori words for (flea), and therefore expresses derogatory implications. There is no etymological or linguistic support for this notion — like all Polynesian languages, Māori is generally very conservative in terms of vowels; it would be extremely unusual for ‘pā-‘ to derive from ‘poaka’. The more common Māori word for flea is puruhi. It is also sometimes claimed that ‘Pakeha’ means white pig or unwelcome white stranger. However, no part of the word signifies “pig”, “white”, “unwelcome”, or “stranger”. New Zealanders of European ancestry vary in their attitude toward the word “Pākehā” as applied to themselves. Some embrace it wholeheartedly as a sign of their connection to New Zealand, in contrast to the European identity of their forebears. Still others find the term as being predominantly a relational term, and as archaic as calling Māori “natives”, while also lacking any meaningful description of cultural roots. It is commonly used by a range of journalists and columnists from the New Zealand Herald, New Zealand’s largest-circulation daily newspaper. Others object to the word, some strongly, claiming it to be derogatory or to carry implications of being an outsider, this is often based on false information about the meaning of the term. Some believe being labelled as Pākehā compromises their status and their birthright links to New Zealand. A joint response code of “NZ European or Pakeha” was tried in the 1996 census, but was replaced by “New Zealand European” in later censuses because it drew what Statistics New Zealand described as a “significant adverse reaction from some respondents”. Sociologist Paul Spoonley criticised the new version, however, saying that many Pākehā would not identify as European. The term Pākehā is also sometimes used among New Zealanders of European ancestry in distinction to the Māori term Tauiwi (foreigner), as an act of emphasising their claims of belonging to the space of New Zealand in contrast to more recent arrivals. Those who prefer to emphasise nationality rather than ethnicity in relating to others living in New Zealand may refer to all New Zealand citizens only as New Zealanders or Kiwis. A survey in 2013 found no evidence that the word was used in a derogatory sense. The point at which European settlers in New Zealand became Pākehā – or indeed New Zealanders – is subjective. The first European settlers arrived in New Zealand in the early nineteenth century, but most were missionaries, traders and adventurers who did not intend to stay permanently. From the 1840s, following the signing of the Treaty of Waitangi and the assumption of British sovereignty, large numbers of Europeans began to settle permanently in New Zealand. Most of these settlers were from Britain, with a disproportionate number coming from Scotland. There were also numerous settlers from Ireland and Northern and Central Europe. In the late nineteenth century there were some moves towards cultural nationalism, and many Pākehā began to see themselves as different from people living in Britain. However, there were still strong ties to the ‘mother country’ (the United Kingdom, particularly England), which were maintained well into the twentieth century. Until some point in the mid twentieth century most Pākehā considered themselves to be both British and New Zealanders. Many Pākehā intellectuals migrated to Britain in order to pursue their careers as this was not possible in New Zealand. Notable expatriate Pākehā from this period include writer Katherine Mansfield and physicist Ernest Rutherford. Pākehā ties with Britain were drastically weakened in the decades after World War II. Quicker, cheaper international travel allowed more Pākehā to visit and live in other countries, where they saw that they were different from the British and felt the need for a stronger national identity. In 1973, Britain joined the European Economic Community, cutting New Zealand off from free trade with its biggest market and leaving Pākehā feeling betrayed by the people they had thought of as their own. Meanwhile, Māori were becoming more assertive, especially about the value of their culture and their ownership over it. The Māori cultural renaissance made many Pākehā feel that they lacked a culture of their own, and from the 1970s numerous Pākehā writers and artists began to explore issues of Pākehā identity and culture. It was at this point that the word ‘Pākehā’ grew in popularity, although it remained controversial. In general, Pākehā continue to develop identities distinct from and complementary to those of their (often) British origins and those of the other Anglosphere nation-states such as Australia, the United States, Canada and Ireland, as well as Māori. As with most other settler societies, it can be said descriptively that Pākehā contemporary culture is an amalgam of cultural practices, tensions, and accommodations: British/European with some Māori and Polynesian influences and more recently wider cultural inputs, particularly from Chinese and other Far Eastern cultures. Some have also argued that especially modern Pākehā culture is defined by “shock entry” of Britain into the European Economic Community in 1975, which “[left] the descendants of the colonisers, the Anglo-Celtic majorities, seemingly abandoned and marooned in Australia and New Zealand”. Christianity in New Zealand, despite its foreign origins, has also been shaped by Māori through movements such as the Ratana Church and Destiny Church, as well as their involvements in churches of European origin such as the Anglican Church. Where Pākehā identity is identified, commonly NZ kitsch and symbols from marketing such as the Chesdale Cheese men are used as signifiers, and might more appropriately be called “Kiwiana”. Michael King, a leading writer on Pākehā identity, discussed the concept of distinct Pākehā practices and imaginations in his books: Being Pākehā (1985) and Being Pākehā Now (1999), and the edited collection, Pakeha: The Quest for Identity in New Zealand (1991), conceptualising Pākehā as New Zealand’s “second indigenous” culture. This is a list of New Zealand disasters by death toll, listing major disasters (excluding epidemics and acts of war) which occurred in New Zealand and its territories or involved a significant number of New Zealand citizens, in a specific incident, where the loss of life was 10 or more. 12 Brigantine Rio Loge shipwreck (presumed) Jan 1909 Last seen in Cook Strait on 14 January, en route from Kaipara to Dunedin May have caused the wreck of the Penguin a month later. Welch, Denis (4 February 2006). “Shake, Rattle & Roll”. New Zealand Listener (3430): 29–30. A larger death toll of 258 includes two missing, presumed dead. 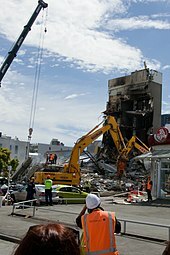 “List of deceased – Christchurch earthquake”. New Zealand Police. 9 February 2012. Retrieved 24 February 2012. Waihi Landslide, GeoNet News, Vol. 2, February 2003, p. 7. Death toll calculated by subtracting death tolls for two later landslides (64 and 1 in 1846 and 1910 respectively) from the total of “more than 200” given for all three. The eruption’s death toll is uncertain. While 153 is a commonly quoted figure, only 108 named victims have been identified. Death list, Anheizen.com. Disasters and Mishaps – Flood Hazards – Blizzard and Flood in 1863, from An Encyclopaedia of New Zealand, edited by A. H. McLintock, originally published in 1966. Accessed 2008-01-22. The Missing New Zealand Ship ‘MATOAKA’, which cites The Times, London, 22 March 1870, page 9. Accessed 2008-05-21. Five more died before the survivors were rescued 18 months later. Lamorna Cooper, Hipaua Steaming Cliffs and Little Waihi Landslide, Tephra, Vol. 19, June 2002, 42-47. The original Wahine death toll was 51; two names were added 22 and 40 years later. Three more people were killed by Cyclone Giselle elsewhere in New Zealand. New Zealand Disasters – Mining: Ralph’s Mine, Christchurch City Libraries. ^ Jump up to:a b c d e New Zealand disasters timeline, Ministry for Culture and Heritage. ^ Jump up to:a b c d Disasters and Mishaps – Shipwrecks, from An Encyclopaedia of New Zealand, edited by A. H. McLintock, originally published in 1966, updated 2007-09-18. Dunedin, which cites W.H. Brett’s White Wings: Fifty years of sail in the New Zealand Trade, Vol. I. 1925. Beswick, Angela. “Pike River: Second explosion, no survivors”. 3 News. Retrieved 19 November 2010. Field, Michael (6 March 2012). “1955 Pacific mystery to be finally marked”. stuff.co.nz. Retrieved 8 March 2012. All 25 on board were missing when the boat was found, and are presumed dead. New Zealand Disasters – Kopuawhara flood, Christchurch City Libraries. Ryburn, Wayne (1999). Tall Spars, Steamers & Gum. Auckland, N.Z. : Kaipara Publications. p. 230. ISBN 0-473-06176-7. “Not many remember the Sophia Pate”. New Zealand Disasters – Strongman Mine Explosion, Christchurch City Libraries. Clyde, Dive New Zealand Magazine. The Lastingham Wreck, Paul’s Dive Planet. Eileen McSaveney, Historic earthquakes – The 1929 Arthur’s Pass and Murchison earthquakes, Te Ara – the Encyclopedia of New Zealand. Updated 2007-09-21. Accessed 2008-01-05. Livingstone, Bob (1998). Under the Southern Cross: The B-24 Liberator in the South Pacific. Turner. p. 115. ISBN 1-56311-432-1. New Zealand Disasters – Brynderwyns bus accident, Christchurch City Libraries. Disasters and Mishaps – Shipwrecks – Holmglen, from An Encyclopaedia of New Zealand, edited by A. H. McLintock, originally published in 1966, updated 2007-09-18. “The Derry Castle”. Museum of New Zealand Te Papa Tongarewa. Retrieved 2009-04-18. A. H. McLintock, ed. (1966). “Pre-war and Wartime Accidents”.An Encyclopaedia of New Zealand. Retrieved 7 January 2012. Weekly Feature – Early settler had leading role, Wairarapa Times-Age, 17 May 2003. Disasters and Mishaps – Shipwrecks – Ventnor, from An Encyclopaedia of New Zealand, edited by A. H. McLintock, originally published in 1966, updated 2007-09-18. The cargo included 499 corpses, which were never recovered. Three more died before being rescued. The Wreck of The “Zuleika”, Palliser Bay. Quotes from NZ Truth, 16 March 1976. “The Rio Loge”. Press (Wellington). Press Association. 13 February 1909. p. 11. Retrieved 11 May 2012. “Supposed Hull of Rio Loge”. Poverty Bay Herald. 22 February 1909. p. 5. Retrieved 11 May 2012. Stacey Wood; Greer McDonald (11 February 2009). “Search for wreck of Penguin”. Dominion Post. Retrieved 11 May 2012. “Hot air balloon crash near Carterton kills 11”. Stuff.co.nz. Retrieved 2012-01-07. Sherwood, Alan and Phillips, Jock. “Coal and coal mining”. Te Ara – the Encyclopedia of New Zealand. Retrieved 2009-04-18. Lomas, David (10 April 2010). “Secret deaths”. The New Zealand Listener. Retrieved 2012-01-07. “Accident description”. Aviation Safety Network. Retrieved 2009-04-17. “Loss of the brig Australia, at Cape Campbell”. Grey River Argus. 7 June 1873. p. 2. Retrieved 11 May 2012. “Yacht Wrecked in Ocean Race”. The Press. 29 January 1951. p. 6. Retrieved 2009-04-18. A death toll of 12 is sometimes given. This may include two miners who died during the year before the lahar. John Wilson, The voyage out – Fire on the Cospatrick, from Te Ara – the Encyclopedia of New Zealand. Updated 2007-09-21. Accessed 2008-05-20. Board of Trade Wreck Report for ‘Knowsley Hall’, 1880, Board of Trade, 1880. Accessed 2008-05-21. Aramoana massacre 13 November 1990-14 November 1990 Aramoana, New Zealand 14 3 (unofficially 4) injuries. Shooter among dead. Himatangi tragedy 6 September 1929 Himatangi, New Zealand 7 Unsolved shooting and arson, possibly murder/suicide. Waikino School Tragedy 19 October 1923 Waikino, New Zealand 2 Gunman killed 2 children, 4 children injured, 2 adults injured.